Georgia’s HOPE Program was legislated in 1992. HOPE stands for “Helping Outstanding Pupils Educationally.” The program is administered by the Georgia Student Finance Commission (GSFC), and program details can be found at the Georgia Futures website. Home Study—means an arrangement whereby a school-aged child is involved in a course of study in which instruction is carried out at the direction of the parent rather than in a traditional classroom setting and is governed by and operating in accordance with the requirements of O.C.G.A. § 20-2-690(c). Accredited High School Program—means a program of study, resulting in a high school diploma and transcript at a secondary educational institution meeting the definition of an Eligible High School, completed by a student who would otherwise be considered a Home Study student. 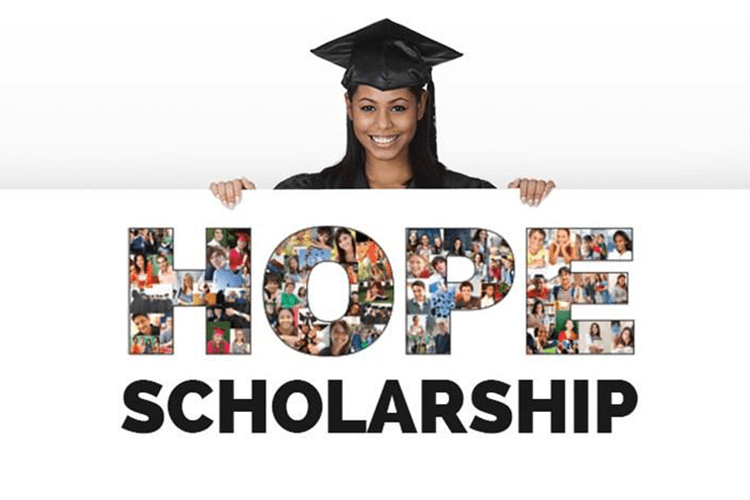 Georgia’s HOPE Scholarship is a merit-based award available to Georgia residents who have demonstrated academic achievement. The HOPE Scholarship (in combination with the Zell Miller Scholarship, if applicable) is valid for 127 attempted semester hours of college coursework leading to a college degree. The scholarship provides tuition assistance to students pursuing an undergraduate degree. Awarded upon Entering College as a Freshman—Requires a minimum score at or above the 75% nationally on the SAT/ACT during a single testing session. Score considered is total of reading plus math. Rigor coursework requirements do not apply to students who complete a home study program. Retroactive Award—Requires the completion of 30 semester hours of college coursework after high school graduation while earning a minimum GPA of 3.0 (on a 4.0 scale). Once eligible, student is reimbursed for the 30 hours completed and is awarded HOPE for the coming terms (subject to the periodic GPA checkpoints that apply to all students). Rigor coursework requirements do not apply to students who complete a home study program. Students who graduate from an Accredited High School Program may qualify for HOPE by earning a minimum GPA of 3.0 (on a 4.0 scale) in core subject high school courses. Additionally, accredited high school program graduates (2017 and later) must have completed at least four academic rigor courses. A course is determined to be an academic rigor course pursuant to the program Regulations. Zell Miller Scholarship is a merit-based award available to Georgia residents, similar to the HOPE Scholarship, but with more stringent academic requirements and a higher level of tuition assistance. The Zell Miller Scholarship (in combination with the HOPE Scholarship, if applicable) is valid for 127 attempted semester hours of college coursework leading to a college degree. Eligible students are provided full tuition assistance while pursuing an undergraduate degree. Awarded upon Entering College as a Freshman—Requires a minimum score at or above the 93% nationally on the SAT/ACT during a single testing session. Score considered is total of Critical Reading plus Math. Retroactive Award—Requires the completion of 30 semester hours of college coursework after high school graduation while earning a minimum GPA of 3.3 (on a 4.0 scale). Additionally, a minimum SAT score of 1200 (critical reading plus math, in a single sitting) or an ACT composite score of 26 is required prior to high school graduation. Once eligible, student is reimbursed for the 30 hours completed and is awarded Zell for the coming terms (subject to the periodic GPA checkpoints that apply to all students). Students who graduate from an Accredited High School Program may qualify for the Zell Miller Scholarship by earning a combination of a minimum GPA of 3.7 (on a 4.0 scale) in core subject high school courses and a minimum SAT score of 1200 (critical reading plus math, in a single sitting) or a minimum ACT composite score of 26. Additionally, accredited high school program graduates (2017 and later) must have completed at least four academic rigor courses. A course is determined to be an academic rigor course pursuant to the program Regulations. The HOPE Grant is available to Georgia residents who are pursuing a certificate or diploma, typically at a Technical College. The HOPE Grant provides tuition assistance to students enrolled at a HOPE Grant eligible college or university in Georgia. A HOPE Grant recipient must maintain a minimum 2.0 cumulative postsecondary GPA to remain eligible. The Zell Miller Grant is a merit based program available to Georgia residents pursuing a certificate or diploma, typically at a Technical College. Eligible students are provided full standard tuition assistance. A Zell Miller Grant recipient must maintain a minimum 3.5 GPA to remain eligible.